Pauline Hanson is certainly no stranger to controversy. In the wake of the 2015 murder of New South Wales Police Force employee Curtis Cheng by 15-year-old junior jihadist Farhad Jabar Khalil Mohammad, the Aussie answer to Donald Trump made her opinion regarding Muslim immigration quite clear: No more Muslims. Period. The Brisbane-born leader of the One Nation political party and Member of Parliament is again making waves Down Under regarding the country’s ever burgeoning Muslim demographic. With a population slightly over 23 million, the almost half million Muslims equate to roughly one in 50 Australians are adherents to the cult of Mohammad. Nonetheless, the member of the Australian Senate representing Queensland appeared on the news program A Current Affair where her provocative comments made headlines worldwide. In an extraordinary interview that appeared to leave even A Current Affair host Tracy Grimshaw stunned at times, Senator Hanson denied her views were extreme and said she was speaking for ordinary Australians when she voiced fears the country was being overrun by Muslims. 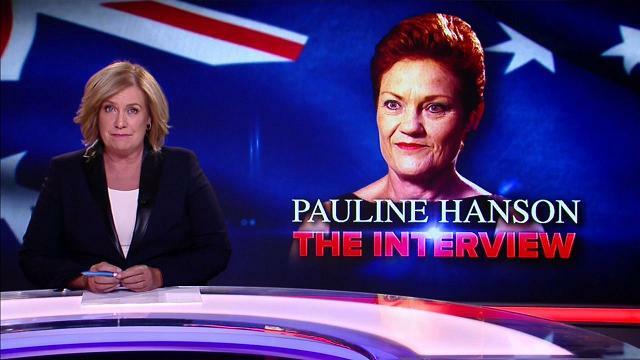 “I hear Australians that have lived just nice, quiet lives in their suburbs and then they’ve had Muslims come in there who have changed their suburbs,” Ms Hanson told the program. “They’ve built these mosques and they have their cars parked across the driveway or they have rubbish thrown over their fences. “Or they go and knock on their door because they won’t move out and threaten them. ‘Listen mate, you better take this suitcase full of cash and get out of here.’ It’s having an impact on our educational system and, you know, in our schools and our swimming baths. [It’s] their attitude. “The burqa should absolutely go. This is Australia. Asked if she believed there were any “good Muslims” living in Australia, Ms Hanson suggested they were difficult to spot. Ms Hanson, who has sparked a war of words with Prime Minister Malcolm Turnbull in recent days over her support of parents who refuse to vaccinate their children, also said Australia was at risk of becoming a “third-world country” if the major parties did not get their act together. “The grumbling from the people — they’re actually fed up with both sides of politics, whether it be Liberal, Labor or the Nationals, and they certainly don’t want the Greens. With nationalism on the rise in the United States and Europe, the movement is also growing in the land of baby-eating dingoes, sharks with frickin’ lasers, and googlie-eyed 80s rockers.